Over the latest years the Summer Breeze has become one of the most important german metal festivals… It started in 1998 with local underground bands and about 1000 visitors … Now bands from all over the world know the name Abtsgmünd as Dinkelsbühl nowadays and Summer Breeze… Bands like Nightwish, Paradise Lost, Amorphis, Dimmu Borgir have played there over the last years and in 2009 about 25000 visitors were counted… One of the best metal festivals in Germany!!! THE FESTIVAL The SUMMER BREEZE Open Air is about to happen for the twelfth time. For the fourth time already the breeze is blowing in beautiful Dinkelsbuehl enriched by medieval, gothic and even electronic winds. Just the air a dark metal fan needs to breathe. As usual the SUMMER BREEZE 2009 will take place over three days on the airfield of Aeroclub Dinkelsbuehl between Sinbronn and Illenschwang. AGE LIMIT Of course, the German law for the protection of the youth in public will apply. That means everyone under 16 years of age has no access to the festival at all. Everyone between 16 and 18 years of age is allowed to stay at the festival until midnight. This law is offset as long as you have a supervisor of full age with you. This means you should have a written confirmation of your parents proving this supervisor is officially authorized and shows his name. The supervisor needs to be able to ID himself! Otherwise and in case of a police check you may have to leave the site! The supervisor has the right to supervise more people than just one. This goes for both, camping and festival area! The opportunity of the journey home for the person to be supervised has to be certain. Drinking any form of alcohol under the age of 18 is strictly prohibited and against the German law! The written confirmation form can be downloaded HERE! ARRIVAL/DEPARTURE The camping ground can be entered on Wednesday from 10 a.m. on and has to be cleared on Sunday until 2 p.m. The daily parking lot will be opened from 9 a.m. on. The camping site, parking lots and the festival site will be signposted across the entire Dinkelsbuehl area extensively! PLEASE NOTE: To not strain the high traffic additionally it will be impossible to leave the camping ground by car once you have entered it. This goes for the entire Wednesday until Thursday afternoon. The free of charge shuttle bus will lift you to the centre of Dinkelsbuehl. BEERGARDEN Also in 2009 there will be a beer garden. So whoever might need a break has the chance for a drink and some food in a comfortable atmosphere right here! CAMERAS Regular analogue or digital compact cameras as well as mobile phones with integrated cameras are allowed. Reflex cameras with changeable objectives, video cameras and any recording equipment is strictly prohibited on the festival site without the according SUMMER BREEZE press passes! CAMPING AND PARKING There will be enough parking and camping space available. You can park your car right next to your tent. Camping without buying a festival ticket is not permitted. Parking and camping will be included in the festival ticket price. Therefore please do use the advised parking and camping areas! Reservations for camping spaces cannot be made. The daily parking area can be found just across the street of the camping site entrance. Of course you can also park your car there while camping on the camping ground. This is especially comfortable if you intend to leave the festival early and need to make sure you can move your car anytime. Please note: only vehicles not heavier than 3,5 tons will have access to the camping ground. Camping outside the official camping area is prohibited. Doing so will be ticketed! The police will have an eye on that! CASH MACHINES The nearest cash machine is located in Illenschwang, just across the street from the camping site. But various cash machines can be found in Dinkelsbuehl city. CREW AND SECURITY Be nice to these boys and girls. Treat them the way you want them to treat you. Their job is not an easy one anyway. Our securities will be wearing numbers so they can be easily identified. In case you do not feel treated appropriately by the security please inform our staff at the ticket counters immediately by providing the security’s number. We will then take further steps to solve the problem! DINKELSBUEHL As the festival site is about 5 km far from Dinkelsbuehl city we will again set up a bus shuttle to Dinkelsbuehl and back. Dinkelsbuehl itself has numerous attractions and opportunities to offer. You can do some shopping in the picturesque medieval Old Town, check out a few of the countless cafes, restaurants and bars or visit the indoor swimming pool as well as one of the last river open air swimming pools, the Woernitz beach bath! DOGS Dogs and pets and animals in general are forbidden on the entire festival and camping ground. DOORS OPEN Doors to the festival site will open on Thursday at 11 a.m., Friday and Saturday at 10 a.m. The show starts at 1 p.m. on Thursday, 11 a.m. on Friday and Saturday. When entering the festival site you will have to go through additional security checks. Make sure you only carry the permitted quantity of drinks in the corresponding boxes and cans as well as the permitted kinds of cameras as otherwise we will have to take them off you. In addition, the following items are prohibited on the festival site: pocket knifes video cameras, video mobile phones, walkman, cassette and MD recorders, any pyrotechnical gear, any sort of cans (hairspray, deodorant), flacons, flag staffs, sticks, nail files as well as gas driven horns. FESTIVAL ACCESS WRIST BAND Right at the drive through to the camping site we will change your tickets for the festival wristbands. You have to show your wristband to any security or staff member asking for that. Therefore it is prohibited to take it off from Wednesday till Sunday. FESTIVAL PROGRAM The official SUMMER BREEZE festival program can be purchased at both merchandise booths for a contribution towards costs of 1,- EURO. In it you will find all info regarding the festival and the bands and the running order. It’s also a perfect item for the bands to sign at the signing sessions. FIRE Open fire is strictly prohibited throughout the entire camping and festival site. Camping stoves and barbecue grills are allowed as long as they are not used for purposes other than intended. FIRST AID Right at the entrance to the festival area a huge first aid center can be found. Despite that there is a first aid station on the camping site. These two first aid stations will be open 24 hrs. FOOD/DRINKS Of course, we have taken good care of your physical needs again. Stalls can be found throughout the site. You may bring your own drinks (for your personal needs only) to the campground. At the festival site only a tetra pack or a plastic bottle of up to 0.5 liters per person is allowed as well as SUMMER BREEZE 0,4 ltr mugs and SUMMER BREEZE 1,0 ltr beer tankards. PLEASE NOTE: There is a strict glass prohibition on the entire festival and camping ground! GARBAGE A lot of people do leave a lot of trash, that is pretty obvious. One more reason why why we need to ask you to help us solving the trash situation. During the last years the costs for waste disposal have risen drastically and that we have to refere to. Also in 2009 you will be getting trash bags again which you please fill up with your waste. A big thank you for your understanding and your help in advance. As more and more people show up bringing tons of furniture and disposing of it is more expensive than 2-3 people’s tickets in 2008 again security guards will check the camping ground and take pictures of your car and anything suspicious you might leave behind after your departure. In case of offence you will be charged extra for waste disposal and each case will be brought to court as this is illegal! Please also make sure you keep your camping space tidy during your entire stay. Securities will be crossing the camping site to check! Please make sure you do not forget any metal items such as nails for your tent and so on as this is a serious problem. GLASS PROHIBITION Unfortunately some of the festival visitors force us to strictly prohibit any glass on the festival site as well as on the camping ground. This contains porcellaine as well as stoneware, too! We will strictly check each car entering the site. The car checkingss while entering the camping ground do strain the traffic flow enormously and will take way longer than necessary depending on how much glass will be found in your car. Our security will also check the camping ground during the festival days. Please avoid bringing any kind of glass, regardless of what it stores. Flacons and medicines are allowed up to a quantity of 50 ml. Best thing to do is to change everything into plastic containers. Please stick to this rule as otherwise we will have massive problems to get access to appropriate camping grounds in 2010! KIDS Kids up to the age of 12 in guidance of their parents have free access to the festival. LOST AND FOUND In case you have found a lost property please drop it either at the official SUMMER BREEZE merchandise booth or the ticket counters! We will be bringing all lost items to the shower station several times a day. So when you have lost something please get in touch with the people at the shower station. Any item not being picked up by the end of the festival will be given to the official lost and found office in Dinkelsbuehl. NON-FOOD This year again our trading-mile will offer you a large choice of CDs, textiles, jewelry and many more. PHARMACY The nearest pharmacy (Aesculap-Apotheke) can be found in Dinkelsbuehl near the main bus station (inside the REWE supermarket next to McDonalds, Luitpoldstr.27). In addition to that there are about ten more pharmacies within the Dinkelsbuehl area. POLICE The local police will serve and protect you. Don’t worry. Each of them is really nice and willing to help wherever possible. But of course they will do drug and alcohol checks as usual. Not only for that reason but also for your own safety please make sure your driver stays sober or at least takes a nap in the car. We will not clear the daily parking lot so you can stay there overnight. The police checks on Sunday will certainly happen! So be clever! POST/MAIL There are letter boxes in Sinbronn and Illenschwang which have a daily service except on Sunday. The nearest post office is in Dinkelsbuehl (Luitpoldstr. 13) just next to the local police station. 2 minutes walking distance from the bus station / McDonald’s. RACISM Is a no go! Hereby we once again would like to state we are strictly against any form of right-wing philosophy and racism. We also count on your help. In case of you seeing something please inform us immediately! Either approach the security or, even better, go to the ticket counter. We will take immediate action against the people involved. RUNNING ORDER A detailed running order can be found on www.summer-breeze.de under BANDS 2009 beginning of July the latest. SHOWERS This year again you will find our huge shower station right on the camping ground. For each shower taken we must charge you 2,-€ to cover the costs at least partially. This year we will have 25% more showers. In addition to that we have proper water flushed toilets right at the shower station. Who wants to use the water toilets can do so for a 1,- EUR fee. The shower station is being opened non stop from Wednesday 12.00 h until Sunday 12.00h. Despite that there will be various free water stations where you can get fresh water for cooking and washing. Make sure you don’t waste any water!! Only that way there will be enough water for all of you and refilling won’t be a problem. SIGNING SESSIONS Almost all bands will be doing signing sessions at our partner booths. Please note the scheduled times and make sure you don’t miss this chance. SUPERMARKET Anything you might need to survive this festival weekend, you will find it in our supermarket for reasonable prices. DAILY TICKETS Day tickets will only be available at the counters on that very day. The parking space for day ticket holders is opposite to the entrance area just across the street and will be signposted. Parking will be included in the ticket price. Day ticket holders have no permission for camping. Further information regarding prices and contingents will be announced about a month prior to the festival. TOILETS Always a bit of a problem. But life is not a wishing well. There still is no proper water supply on the site. But also in 2009 we will try to go a step ahead. and bear the consequences. We will service you with a sufficient quantity of toilets. As always they will be emptied several times a day and using them is for free. As on the site there are no sewers we have to rely on mobile toilets and water barrels. If everyone has a bit of consideration for these circumstances this will work without problems. Please do not stick loo paper rolls into the toilet seat. It is quite obvious why! TRADE It is prohibited to trade any kind of goods. TRAIN STATIONS The nearest stations are Ellwangen, Ansbach, Crailsheim, Dombuehl and Noerdlingen. Being there you can easily take a bus to Dinkelsbuehl. For detailed train information please check: www.die-bahn.de. For more info please check under JOURNEY. UTENSILS Iron wear, drinking horns and so on do belong to a festival, no doubt. We do not want to forbid these things and we do trust your reliable use of them. Just self made iron gear and spikes are not to be brought onto the site due to an increased risk of danger! WEAPONS / VIOLENCE So far, there has never been violence at the SUMMER BREEZE and that shall not change. Anyone looking for trouble or damaging anyone’s property, inside the fencing or beyond, will be kicked out!!! Have the guts and interfere or inform the securities if someone starts trouble or harasses girls. Weapons are forbidden on the entire festival site! There should be no need to explain why. That includes baseball racks, knuckle dusters, gas, axes, chainsaws, spades and any dangerous tools such as hammers and so on. HANDICAPED PERSONS As in previous years there will be a special platform incl. a handicapped accessible toilet for the wheelchair-bound. Also on the new festival site we will have a separate camping area for handicapped people close to the entrance area. In addition, entrance is free for people with a disability of 51% and more and / or whose ID shows the according stamps. PLEASE NOTE! This ABC will be updated according to changed circumstances and situations. 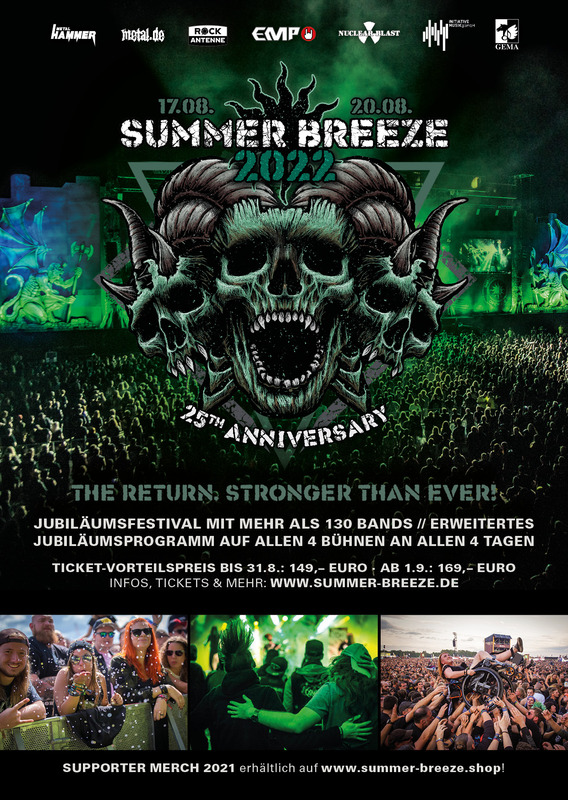 Please check regularly and especially before you departure at www.summer-breeze.de for a final update.